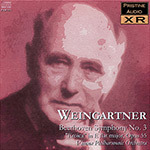 Felix Weingartner was the first conductor to record all nine of Beethoven's symphonies, and had been steeped in the tradition for many years by the time he came to cut the twelve sides which comprise this fabulous 1936 recording. As with a number of other classic recordings of Beethoven there have been numerous transfers and restorations of these recordings. However, with the use of a wonderful set of near-mint Columbia 78s to work on, kindly donated to Pristine Audio for this purpose, and the application of the Pristine Audio Natural Sound technique, it has been possible to take this already superb recording a great step further forward. With the elimination of a harsh upper register and the evening out of some minor errors in the frequency response we finally hear the true majesty of the Vienna Philharmonic Orchestra, and the massive reverberation of the recording hall. This truly in an heroic 'Eroica'! Sometime in the early 1890’s, Brahms was spending some time at the Meiningen court. He had a very high opinion of the orchestra there and had conducted the premieres of some of his own works with the orchestra on occasion as well as appearing as soloist. He noted that Felix Weingartner, the orchestra’s permanent conductor, was giving a concert with the first half devoted to Berlioz and the second half comprising only Brahms’ Second Symphony. Brahms ran into Weingartner during the afternoon and told him with a bit of sarcasm, as was his wont, that he hoped Weingartner would have a little energy left for his work after all that Berlioz. Weingartner, about 30, very handsome, self-confident, and of the minor nobility, assured Brahms that his finest efforts would be reserved for the symphony. Brahms attended the performance and afterwards repaired to the local café with his coterie. Weingartner did likewise. Brahms stood up and invited Weingartner over for a drink, something he almost never did. One must assume that his reaction to the performance was very positive. The characteristics of self-assurance and Apollonian nobility informed everything that Weingartner did. I have always felt that the pinnacle of Eroica performance was eternally contended for by Toscanini (1938, NBC) and Furtwangler (1952, Berlin). But based on Pristine Audio’s brilliant reprocessing, Weingartner’s must be considered for some space on that crag. Weingartner is never as taut or propulsive as Toscanini, but there is more light and shade. There is an occasional moment where Toscanini seems like a demented PacMan, running down the track, chewing up notes and spitting out music. Weingartner does not achieve the elemental, primordial Wagnerian fury that Furtwangler does in the funeral march, but his Scherzo is delightfully balanced and the horns are superb. There is not so much incident in Weingartner’s Eroica, but he knows where the real climaxes are. A beautiful example is just before the recapitulation in the first movement: the development is winding down suspensefully; we are anticipating the recapitulation; and a single horn comes in with the main theme in what seems to be a bar prematurely. Following which the whole orchestra crashes in with the two chords which are the signature of the symphony. Ferdinand Ries, Beethoven’s pupil excoriated the horn player for this “error”, after which Beethoven gave him a box on the ear. This is how Beethoven wrote it. Toscanini passes it like a country station not on his route. Furtwangler does a good job, but Weingartner makes it seem right because he really screws up the suspense. In truth, the really magnificent thing about this recording is the SOUND. Pristine Audio has removed the hum and the distortion; they have somehow returned missing frequencies and harmonics to the dumb shellacs of 1936. The result is not a 2007 stereo or SACD, but the closest we shall now get to that confident man who was not intimidated by Brahms and thought he knew how Beethoven’s greatest symphony ought to go.